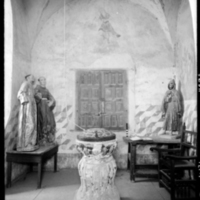 This barely furnished room off the main nave of the mission church of San Xavier del Bac was photographed in 1940 in an effort to document historic works of American architecture. This photograph reveals the presence of colonial-era sculptures, probably made in the 18th century in Mexico City, a major sculpture center and exported to northern New Spain (in what is now Arizona). Baptisteries were special spaces off the nave of a church used for baptisms. This carved stone baptismal font, designed to hold the baptismal waters, was originally covered with a worked metal lid when not in use. It is difficult to identify the saints set in the corners, given the limitations of the photograph and their state of conservation. But their tonsured heads suggest that they were Franciscan saints. The figures at left are missing hands, not an unusual loss because hands were often carved and painted separately, and then pegged into the finished figure. The figure at right appears to be Saint Francis. Franciscans were in charge of the mission of San Xavier del Bac and so his presence of is understandable. While San Xavier del Bac was created under the auspices of the Jesuits and a master builder, the makers of its original sculptures and altarpieces is not known. The provenance of these sculptures was likely central Mexico, perhaps Mexico City. Carved out of wood, the bodies were often covered with gessoed fabric that was then painted to represent clothing. The hands and faces of sculpted religious images, like these, demanded a special painting technique, called encarnación, which mimicked the appearance of skin. Baptisteries like this one could have sculptural decorations, but today these works lack a formal architectural setting, suggesting that they have been moved from other parts of the church and deposited here. Cities, like Mexico City, brought together artisans and religious patrons in high concentrations. Such urban workshops supplied places on the frontier, like San Xavier del Bac in the 17th and 18th century. Along roads crossing the northern deserts, mule trains carried ceramics, textiles and other luxury goods like sculptures to northern outposts like Santa Fe and San Antonio, deeply impacting the visual culture of these margins of empire. 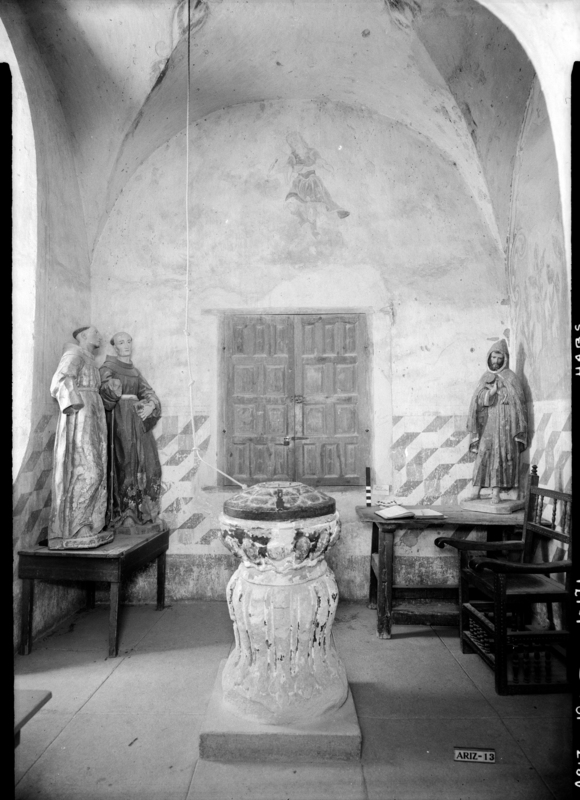 Donald W. Dickensheets, San Xavier del Bac, West wall, Baptistery (east elevation), March 29, 1940. Library of Congress, Prints and Photographs Division, Historic American Buildings Survey, HABS ARIZ,10-TUCSO.V,3-171. American Place: The Historic American Buildings Survey at Seventy-Five Years. 2008. Washington, D.C.: Historic American Buildings Survey. Bargellini, Clara and Michael Komanecky. 2009. El arte de las misiones del norte de la Nueva España, 1600-1821. Mexico City: Antiguo Colegio de San Ildefonso, 2009. Bargellini, Clara and Michael Komanecky. 2009. The Arts of the Missions of Northern New Spain, 1600-1821. Mexico City: Antiguo Colegio de San Ildefonso, 2009. Maquívar, María del Consuelo. 1995. El imaginero novohispano y su obra: las esculturas de Tepotzotlán. Mexico City: Instituto Nacional de Antropología e Historia. Recording a Vanishing Legacy: The Historic American Buildings Survey in New Mexico, 1933-today. 2001. Santa Fe: Museum of New Mexico Press. Umberger, Emily. 2007. “Bac on the Border.” Anales del Instituto de Investigaciones Estéticas 91: 68-123.